FRANK FLANNERY HAS resigned as a director of the Rehab Group and as the director of elections and a trustee of Fine Gael this evening. Flannery, a former CEO of Rehab, has come under pressure in recent days in the wake of a story in the Irish Times which said he was paid thousands of euro by the charity to lobby government departments in 2011 and 2012. He has also faced calls to appear before the Public Accounts Committee (PAC) to answer questions about his membership of the Rehab board, his consultancy work for the disability charity and his pension arrangements. In a statement issued this evening, he said that it was with “real regret” that he has resigned as a director of Rehab but said he had come to the opinion that his involvement is making the organisation “subject of political controversy at this time”. He has also resigned as Director of Elections and as a trustee of the party, saying that his role had only concerned electoral strategy and organisation. Fine Gael said that these were both voluntary positions. Asked about the news this evening, Taoiseach Enda Kenny said Flannery had played an important role in the developlment of the party, both in opposition and in power. 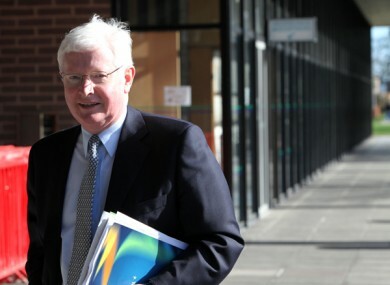 “Frank Flannery has been around since the time of the late Garret Fitzgerald and has always been an important part of the development of Fine Gael in all its phases over the years,” Kenny told reporters at an event in Manchester. The Taoiseach said he noted this evening’s statement and that he hoped Flannery would cooperate with the Public Accounts Committee if he was asked to appear before it. “This is not the way that you would expect things to be,” Kenny said. Earlier, Education Minister Ruairí Quinn told RTÉ Radio how he would see Flannery “the odd time” with Fine Gael advisors prior to Cabinet meetings and said he had discussions with Flannery about the State funding through the charitable lotteries scheme to Rehab “but not in any kind of lobbying way”. In his statement, Flannery praised the government and Fine Gael saying it is performing well and “the economy is on the mend”. He said he will continue to support the party “in any way I can as a private citizen and as a proud ordinary member of Fine Gael”. Responding to his resignation this evening, Fine Gael general secretary Tom Curran thanked Flannery for his “unstinting and loyal service to the party”. “This afternoon I accepted the resignation of Mr Frank Flannery, from his voluntary positions with the Fine Gael party,” Curran said in a statement. “Frank has, over a period of more than four decades, served Fine Gael in a variety of roles. This evening’s resignation is unlikely to dissuade the PAC from seeking Flannery to appear before it in the coming weeks. There have been cross-party calls for Flannery to appear before the public spending watchdog, which were echoed by Justice Minister Alan Shatter this afternoon. A committee source said that members still expect Flannery to come before it regarding outstanding issues they are seeking clarification on, though this may be complicated by the fact that he is no longer a member of the board at Rehab. I have informed the Chairman of the Rehab Group board, Mr. Brian Kerr, that I wish to step down as a director of the Rehab Group and any other group boards with immediate effect. It is a step that I undertake with real regret but I have come to the opinion that my involvement with the board is making the Rehab Group the subject of political controversy as this time. I spent 34 years in the Rehab Group and retired in December 2006. I rejoined the board in 2011. The Rehab Group has played an enormously valuable role in Irish Society for nearly 70 years and I wish it continued success for the future. I have also informed the General Secretary of Fine Gael, Mr. Tom Curran, that I am stepping down as Director of Elections and as a Trustee of the party as of today. My involvement with Fine Gael related only to electoral strategy and organization and I had no role in advising the government. Fine Gael has been mandated, along with the Labour Party, with the onerous task of turning the economy around after the deepest recession since 1929. I believe the government, and Fine Gael in particular, is performing well and the economy is on the mend. The party and the Taoiseach will continue to have my complete support and I will assist the party in any way I can as a private citizen and as a proud ordinary member of Fine Gael. A statement released this evening from the board of the Rehab Group confirms that they have received his resignation as board member of the Rehab Group and its subsidiary companies. The board of the Rehab Group would like to sincerely thank Mr Flannery for his service as a board member and wish him well for the future. Email “‘I had no role in advising the government’: Frank Flannery resigns from Rehab and Fine Gael”. Feedback on “‘I had no role in advising the government’: Frank Flannery resigns from Rehab and Fine Gael”.